Scarce dual map showing Manhattan and Brooklyn. Complete Map of the Cities of New York, Brooklyn and Williamsburgh. An exceptionally scarce 1852 map of New York City by Charles Magnus. Essentially two maps on one sheet. The left-hand map focuses on Manhattan and adjacent parts of Brooklyn. It extends northwards as far as 51st street. 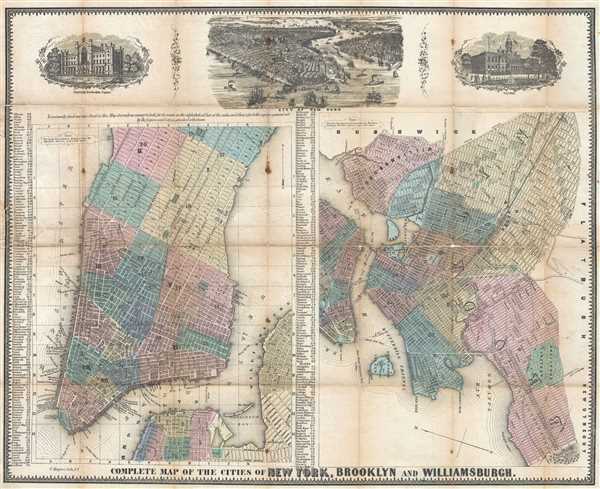 The right-hand map focuses on Brooklyn and Williamsburg when they were considered separate cities. It depicts Williamsburg as far as Morril Street and extends westward south of Division Avenue (current day Broadway) as far as Gowanus Bay and 59th Street. It extends eastward as far as Montgomery Street and Greenwood cemetery. The map is bounded by Bushwick on the north and Flatbush on the east. Throughout, both maps illustrate streets, important buildings, parks, city wards, piers, ferries, and rail lines. Surmounting the map there are three engraved views illustrating the University, Washington Square (future NYU), Manhattan as seen from the south, and New York's City Hall. This map was engraved and issued by Charles Magnus in 1852. Very good. Backed on archival tissue for stability. Closed tear extending approximately 1.5 inches into the printed area from left margin along with other minor closed tears along left margin. Light soiling. Blank on verso. Haskell, D., Manhattan Maps: A Co-operative List, 962. OCLC 40996790.